Meanwhile, the radical Belgian-French political economist Gustave de Molinari also turned to a new analysis of the state prompted no doubt by the extraordinary events of 1848. In the second half of 1848 Molinari began a revolutionary re-examination of the nature of the state and what might replace it in a fully free society. Given the recent history of the free trade movement in England and France (Richard Cobden's Anti-Corn Law League achieving its goal of eliminating protection in England in 1846; while Bastiat's Free Trade Association lost the crucial vote in France in 1847 to achieve the same thing) Molinari began to think that the same arguments which led the liberal political economists ("les économistes" in French) to argue for "free trade" led logically to the notion that they should also advocate "free government", i.e. a system in which the provision of security would not be monopolized by any body (whether it called itself "the state" or any other group) and where free competition would enable competing suppliers to enter the market to serve the needs of consumers. (A)t the risk of being considered utopian, we affirm that this is not disputable, that a careful examination of the facts will decide the problem of government more and more in favor of liberty, just as it does all other economic problems. We are convinced, so far as we are concerned, that one day groups will be established to agitate for free government, as they have already been established on behalf of free trade. 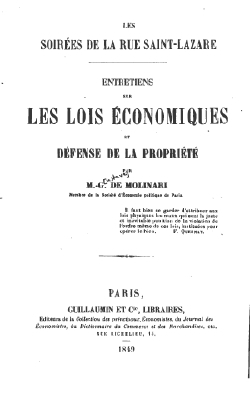 Soon after the appearance of this article Molinari produced a book later in 1849, Les Soirées de la rue Saint-Lazare; entretiens sur les lois économiques et défense de la propriété, in which he developed his ideas further. It caused a sensation at one of the monthly meetings of the Société d'économie politique when Molinari's ideas where discussed. Equally upsetting to the other members of the Society apparently were Molinari's arguments against eminent domain, such was the rigour of his belief in individual property rights. After the coming to power of Louis Napléon and his coup d'état in December 1851 (he annointed himself emperor Napoléon III the following year), Molinari left Paris in disgust (and perhaps also as a precaution) and took up a position in Brussells teaching political economy. In 1855 he published his textbook based upon those lectures, Cours d'économie politique, professé au Musée royal de l'industrie belge, 2 vols. (Bruxelles: Librairie polytechnique d'Aug. Ecq, 1855), in which he elaborated further on his ideas on "la liberté de gouvernement" (free government), or in other words, his theory of anarcho-capitalism. The late 1840s produced other very important books and articles which dramatically pushed the classical liberal movement in a more radical direction. Pocock once spoke of the "Machiavellian Moment" in the late renaissance period. I think we can confidently speak here of an "Anti-Statist Moment" in Paris between 1846 and 1855 which produced Charles Coquelin's book advocating free banking (1846), Molinari's essay on "The Production of Security" (1849), Bastiat's essay on "The State" (1848) and his book on Economic Harmonies (1850), Ambroise Clément's essay on "Legal Plunder" in the JDE (1848), and Molinari's treatise on political economy (1855) in which he further developed his ideas on the private provision of security services. We have these seminal articles and chapters in the emergence of the theory of anarcho-capitalism here at this website. Anthology on Molinari's Theory of the State: from "The Production of Security" to Rule by the "Budget-eating Class". Entire Anthology in one file [PDF 26 MB]. Originally published in the Courrier français, 23 juillet 1846; reprinted in Questions d'économie politique et de droit public (Paris: Guillaumin; Brussels: Lacroix, 1861), 2 vols. Vol. 2, pp. 271-275 in a section entitled "La liberté de government" (along with a reprint of "De la production de la sécurité" and the SEP debate in the JDE). Molinari argues that tax payers are like "shareholders" (actionnaires) and that society is like "one big insurance company" ("cette grande compagnie d'assurance"). This is Molinari's first effort at seeing taxpayers as owners of a security producing firm or company. Note the very hesitant "editor's note" which Joseph Garnier felt obliged to insert at the beginning of Molinari's article. He must have felt some awkwardness in publishing this article by one of the young rising stars of the politiical economy group in Paris (Molinari was 30). The chairman of the SEC discussion of Molinari's book (Joseph Garnier) described it as "un sujet très-délicat" [a very delicate or sensitive subject]. Charles Dunoyer suggested that Molinari had been "sept away by the the illusions of logic". 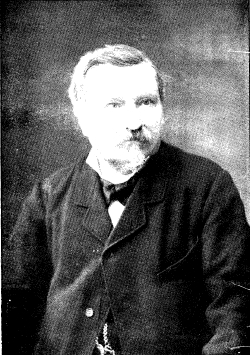 original: Gustave de Molinari, "De la production de la sécurité," in Journal des Economistes, Vol. XXII, no. 95, 15 February, 1849, pp. 277-90. First Translation: Gustave de Molinari, The Production of Security, trans. J. Huston McCulloch, Occasional Papers Series #2 (Richard M. Ebeling, Editor), New York: The Center for Libertarian Studies, May 1977. It can be found in various formats at the Mises Institute website <http://mises.org/resources/2716>. I have re-edited it in parts to make it more faithful to the original article. I have removed the named headings which the translator inserted into the text and replaced them with the original numbered headings; I have added a few italicized words which Molinari used to give special emphasis to certain words and phrases which were overlooked; and changed the wording here and there where I thought the translation was poor. My corrected and revised translation here. Original: Chapter 11 of Molinari, Gustave de, Les Soirées de la rue Saint-Lazare; entretiens sur les lois économiques et défense de la propriété (Paris: Guillaumin, 1849), The 11th Soirée, pp. 303-337. Here he presents in a more popular dialog format (between a Socialist, a Conservative, and an Economist (i.e. him)) the same arguments he provided for a more sophisticated and economically informed audience in "The Production of Security" in the JDE. Book review of Les Soirées by Charles Coquelin in JDE, Vol. XXIV, no. 103, 15 October, 1849, pp. 364-372. [PDF 522 KB]. Molinari, Cours d'économie politique, professé au Musée royal de l'industrie belge, 2 vols. (Bruxelles: Librairie polytechnique d'Aug. Ecq, 1855). 2nd revised and enlarged edition (Bruxelles et Leipzig: A Lacroix, Verbroeckoven; Paris: Guillaumin, 1863). Vol. 2 deals with " La circulation et la consommations des richesses," Part 4 with "De la consommation publique," and the final 12th lesson covers "Public consumption" in which Molinari continues his discussion of what he calls "political competition". "Douzième leçon. Les consommations publiques", pp. 480-534. These were lectures given at the Musée royale de l'industrie belie where Molinari moved after the coup d'état of Emperor Napoleon III. They first appeared in 1855 and a revised edition appeared in 1863. [PDF 1.6MB]. Molinari's Gradual Retreat from Strict Anarcho-Capitalism: from "la liberté de gouvernement" to tutelage, natural monopolies, and the evolution of "self-government". From L'Évolution économique du dix-neuvième siècle. Théorie du progrès (Paris: C. Reinwald 1880). Part II “Développement historique de l’évolution”: Chap. VIII “Le présent,” pp. 253-308. [PDF 1.4 MB]. Chap. X “Les gouvernements de l’avenir” from L'Évolution politique et la Révolution (Paris: C. Reinwald, 1884), pp. 351-423 [I have translated pp. 351-399]. Chap. XI "Tutelle et liberté", pp. 424-506. [PDF 7.9 MB]. Book 4 “La servitude politique”, chap. XIII "L'abolition de la servitude politique," pp. 238-244; chap. XIV "La constitution naturelle des gouvernements" pp. 245-259; chap. XV "La liberté de gouvernment" pp. 260-268. from Les Lois naturelles de l'économie politique (Paris: Guillaumin, 1887). As late as 1887 Molinari is still defending his idea of "la liberté de government". He draws a parallel between "la liberté du commerce" [free trade] which had a vigorous organization lobbying for its introduction, especially in England with Richard Cobden's Anti-Corn Law League, and "la liberté de gouvernement" [free government] which did not. Précis d'économie politique et de morale (Paris: Guillaumin et cie, 1893), Chap. VI "Les droits politiques," pp. 203-208. [PDF 1 MB]. Molinari's retreat from strict anarcho-capitalism in 1899 in Gustave de Molinari, The Society of Tomorrow: A Forecast of its Political and Economic Organization, ed. Hodgson Pratt and Frederic Passy, trans. P.H. Lee Warner (New York: G.P. Putnam’s Sons, 1904). Although GdM continues to quote passages from the "Production of Security" (and the quote from Smith on courts charging fees for service) he now thinks security is a "naturally collective" good. He does think however, that states should outsource the provision of security to keep costs down. He stops using the expression "la liberté de government". English version available at the OLL <http://oll.libertyfund.org/title/228>. French version: Esquisse de l'organisation politique et économique de la société future (Paris: Guillaumin, 1899). Chaps. III, IV, V. "La constitution libre," pp.69-93. [PDF 1.8 MB]. "Chap. XII "La crise" and Chap. XIII "Risques de décadence et chances de progrès" in Économie de l'histoire. Théorie de l'évolution (Paris: Félix Alcan, 1908), pp. 219-257. [PDF 1.3 MB]. "Le XIXe siècle", Journal des Èconomistes, Janvier 1901, pp. 5-19. [PDF 862 KB]. "Le XXe siècle", Journal des Èconomistes, Janvier 1902, pp. 5-14. [PDF 667 KB]. Molinari's last published work (the year before he died) was appropriately called Ultima Verba: Mon dernier ouvrage [Last Words: My last work] (Paris: V. Giard et E. Brière, 1911). The following chapters show how radical GdM still is on may topics: "I. Le vol et l'échange" pp. 35-46; "Qu'est-ce que l'impôt" pp. 35-46; and in the "Préface" pp. i-xvii he still talks about the superiority of a political system based upon private companies controlled by shareholders who decide decisions about the firm (p.xv). [PDF 3 MB]. Yves Guyot's obituary in the JDE, T. XXXIII, Février 1912, pp. 177-196. [PDF 855 KB].